If you read my post from February 13th of this year (click here to read it), then you know that pictured above are pumpkin plants beside the sidewalk leading to the front door of our house. In February, I tried transplanting those first several pumpkin plants to the garden in the back yard. Sadly, they didn’t survive my farming skills. But to my surprise, three more pumpkin plants recently came up in the same place out front. I had to mow and weedeat but have decided to leave these alone and see what happened since my transplanting efforts failed last time. I just couldn’t bring myself to mow these down, even though it’s the “wrong place” to grow pumpkins… and the “wrong way” to grow pumpkins… and the “wrong time” to grow pumpkins. PR31 thought it was funny that I left them because she didn’t think they would ever produce. So I had to snap this pic this past Monday when I walked by and saw the one plant blooming. They are some persistent little plants. Sounds to me like God doesn’t mind if we are “persistent little pumpkins” when we talk with Him. In fact, it sounds to me like He even encourages it. So let’s be persistent today. God won’t mind. 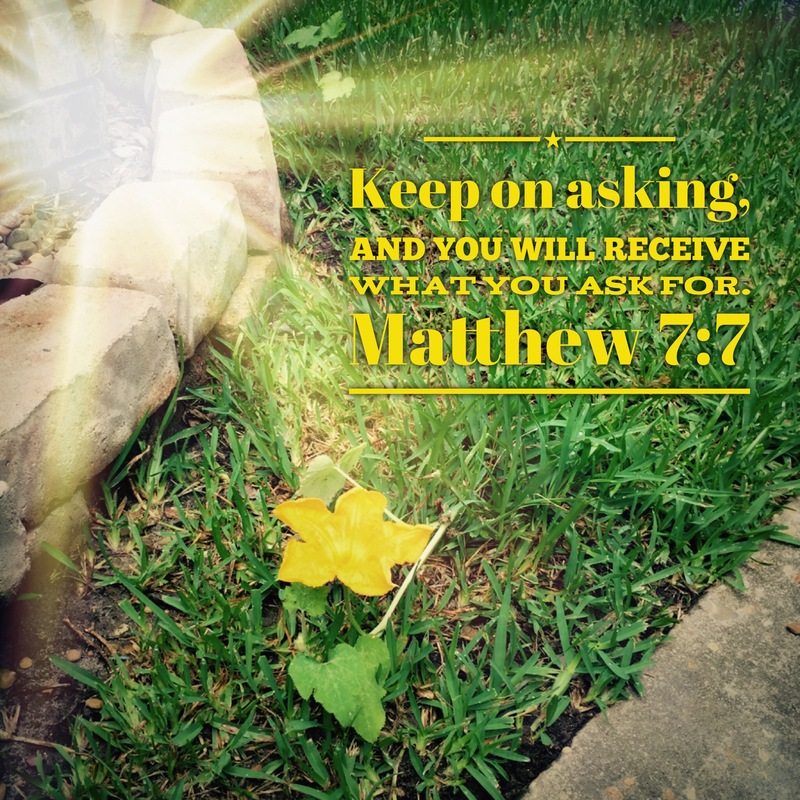 And we can be sure that we will receive what we need when we keep on asking… We will find what we’re looking for when we keep on seeking Him… We will have doors of opportunity opened to us when we keep on knocking. And when you are tempted to give up, just remember those pumpkin plants that just keep growing in my front yard… and ask, seek, knock one more time!